1. Innovative multi-points RF treatment probes, which output more RF energy, effectively rejuvenate skin, remove wrinkle and tighten loose skin. 2. 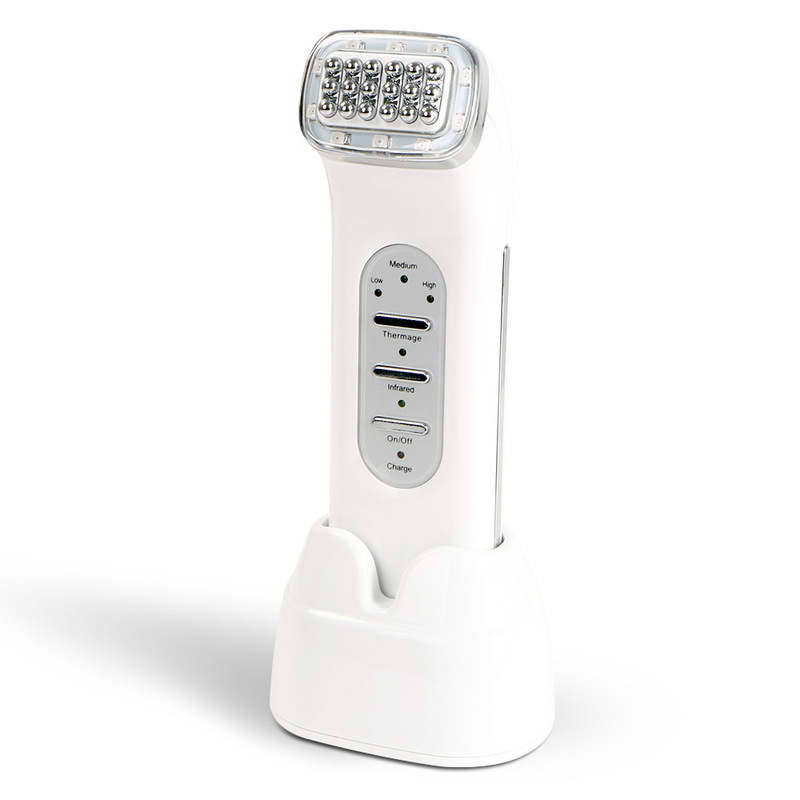 Integrating high energy infrared, improve therapeutic efficacy. 3. Portable and rechargeable, easy to carry and use anywhere & anytime. 5. Inductive design, the treatment probes only get working when touch skin, intelligent and energy-saving. 6. Low/Medium/High levels for options, fitting for different demands and skin types. 7. Intelligent low voltage alarm, charging and full charged indicators. The radio frequency instrument uses high-speed radio frequency technology of 6 million times per second to act on the skin. The molecules in the skin generate heat energy after high-speed movement of the radio frequency. The skin dermis tissue will synthesize a large amount of new collagen after a large amount of heat absorption, and the wrinkles are obtained in large quantities. The nascent collagen is smoothed and the skin tissue is tightened, prompting the skin to quickly return to a young and healthy state, thereby achieving the beauty effect of eliminating wrinkles and tightening the skin and delaying skin aging. Rf could imporve the penetration of skin care products, promote the absorption capacity for skin. Combining the RF beauty device and skin care products, it will bring better effect of refreshing, beautifying and rejuvenating skin. The wavelength of infrared is 880nm, its invisible for eyes. It could penetrate into deep skin, and generate thermal energy, metabolism, keep skin healthy and energetic.